We have just celebrated our fourteenth Birthday with a party. We were also able to give a substantial amount of money to charity. 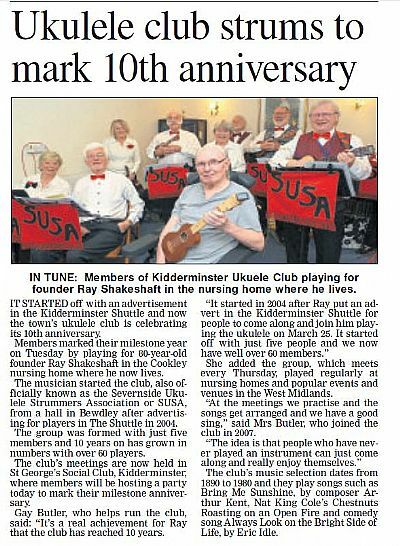 We gave £300 to Bewdley Stroke Association in memory of Ray our founder, £300 to Mind's garden project, £300 to Kidderminster Prostate Support Group and £300 to Remap, one off inventions for handicapped adults. All this money comes from gigs we play and are charities dear to members' hearts. 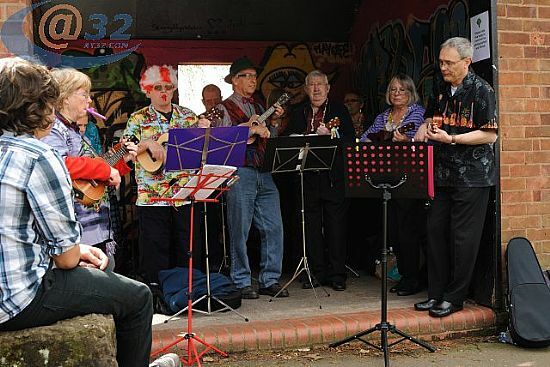 We played several "freebies" helping to raise £840 for Alzheimers Society, £400 for Kemp Hospice and returning our fee for Astley and Dunley Stroke Cafe. In 2017 SUSA celebrated it's thirteenth birthday. On our twelth Anniversary and we invited past members to join us for the evening. We still have nine of the original members who started with Ray and who attend most weeks. 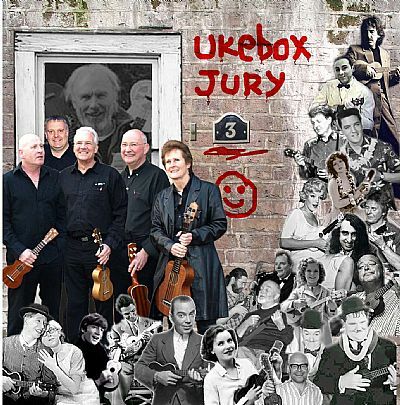 We had also invited old friends, John Coulter from Worfield who gives his expert knowledge at the Uke Days and Uke Box Jury, whom Ray had encouraged to start up their own Ukulele Group down in Swindon. They played some songs for us from their new CD, the front cover of which features many Ukulele artists and Ray himself in the window. We played a selection of songs from each of the decades and some of Ray's old favourites like "Ida" and "I'm Forever Blowing Bubbles"
At our AGM we decided where to send the money we had raised from the various gigs done during the year. £300 went to Prostate Awareness Screening for the Worcestershire area, £200 to Prostate Support based in Kidderminster, £200 to Kemp Hospice and £100 to the Stroke Association in memory of Ray Shakeshaft who started SUSA but died in October 2015.